Even when it’s been spring for months at lower altitudes, it can still look like winter on some of Colorado’s highest mountain passes and scenic drives. Several of Colorado’s most popular scenic drives, including Trail Ridge Road and Independence Pass, require the removal of up to 20 feet of snow before they can open. But when these routes do clear, usually by late May, it’s the best time to see areas alive with wildflowers, creeks flowing with all that snowmelt and incredible mountain vistas. Before heading out, be sure to check that conditions along these spectacular routes are good for a drive. 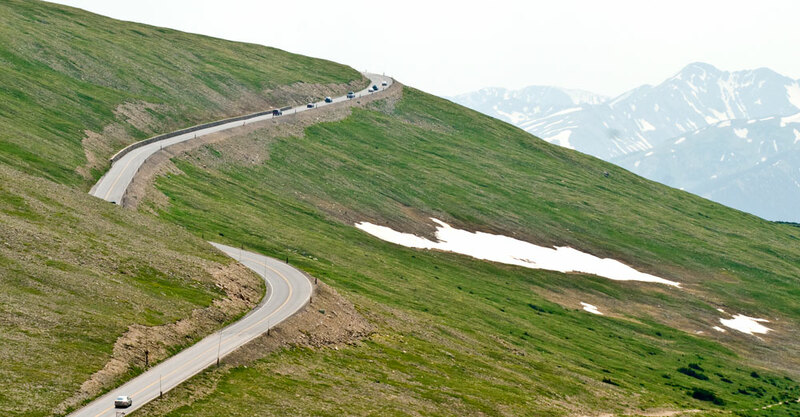 Trail Ridge (U.S. 34): This road through Rocky Mountain National Park is the highest continuous auto road in the country. It’s truly an all-American icon — the road itself is listed on the National Register of Historic Places. Along 48 meandering miles, you can catch views of glacier-carved valleys, daunting peak summits and distant crystalline lakes and cross the Continental Divide. Mt. Evans (CO 5): The highest paved road in North America leads to the summit of Mount Evans. Just off I-70 near Idaho Springs, the road climbs up to 14,258 feet above sea level. At the top, turquoise-hued lakes, towering granite walls and stands of ancient bristlecone pine paint a beautiful picture. But the real draw is the mountain goats and bighorn sheep that can often be found scampering around this alpine paradise. Kebler Pass (C.R. 12): This gravel road linking Crested Butte and Aspen follows Coal Creek and traverses numerous meadows saturated with wildflowers; in fall, countless aspen groves blaze with various hues of gold. Part of the West Elk Loop Scenic and Historic Byway, the road passes by old mining camps and through the mountain towns of Redstone and Carbondale. Boreas Pass (Forest Road 33): Once a Ute Indian trail, then a narrow-gauge railroad pass linking Denver and Leadville during the 1880s silver boom, Boreas Pass is now an outlet to popular hiking and biking trails. An abandoned section house, cabins and railroad relics are reminders of its railroad past. Access to this gravel route can be found just south of Breckenridge. Cottonwood Pass (Chaffee C.R. 306/Gunnison C.R. 209): Heading down Cottonwood Pass Road west of Buena Vista, two behemoth 14,000-foot peaks, Mount Princeton and Mount Yale, tower around you. As you pass beneath the two majestic giants, part of the Collegiate Peaks range, you’ll enter one of Colorado’s most aspen-laden valleys. Many of Colorado’s other beautiful mountain passes stay open and plowed year-round, weather permitting. They should also be on any scenic-drive checklist when they’re decked out in spring’s finery. Monarch Pass (U.S. 50): Connecting the towns of Salida and Poncha Springs with Gunnison, the pass crosses over the Continental Divide through the rugged Sawatch Range. Kenosha Pass (U.S. 285): Known as one of the Colorado Trail’s easiest access points, the pass is also a favorite for its views into the sprawling, green South Park Valley near Fairplay. Guanella Pass (C.R. 381): Bighorn sheep, golden eagles and the occasional mountain goat can all be seen on the jaunt up this paved pass from Georgetown to Grant. Wolf Creek Pass (U.S. 160): Running along the Continental Divide, this gradually winding mountain road north of Pagosa Springs opens to a green valley dotted with little lakes. Cameron Pass (CO Hwy. 14): This route offers views into the wildlife-rich basin of North Park, which has changed little in the 120-plus years since the nearby town of Walden was established. Shrine Pass (Forest Road 709): In summer, this route near Vail dips drivers into meadow after meadow blanketed with wildflowers. Cuchara Pass (CO 12): Below the pass along the Highway of Legends Scenic and Historic Byway is the glorious Cuchara River Valley near La Veta. Rabbit Ears Pass (U.S. Hwy. 40): This pass near Steamboat Springs is the best place to view the extraordinary rock formation it’s named for. The Rabbit Ears served as a distinct landmark to settlers and trappers of yore. Photo: Trail Ridge Road through Rocky Mountain National Park.